Incidentally, the UNIX-style signals can select POSIX realtime signal queuing, if the application wants it. The QNX Neutrino RTOS also extends the signal-delivery mechanisms of POSIX by allowing signals to be targeted at specific threads, rather than simply at the process containing the threads. Since signals are an asynchronous event, they're also implemented with the event-delivery mechanisms. 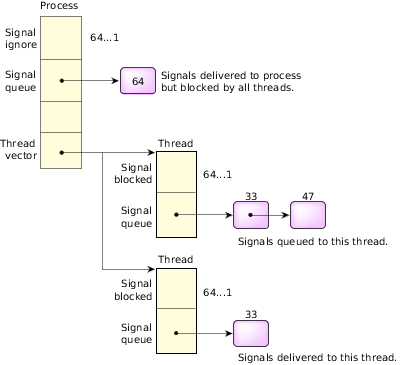 The POSIX standard includes the concept of queued realtime signals. The QNX Neutrino RTOS supports optional queuing of any signal, not just realtime signals. The queuing can be specified on a signal-by-signal basis within a process. Each signal can have an associated 8-bit code and a 32-bit value. Note: It isn't safe to use floating-point operations in signal handlers. As mentioned earlier, the OS defines a total of 64 signals. This table describes what each signal means.